National Trust of Australia (Victoria) was planning to open Underbelly: Squizzy Exhibition for the general public about a famous gangster in Melbourne, Australia in the 1920s called Squizzy Taylor at one of the heritage sites - Old Melbourne Gaol. Orgainsers wanted to show lot of interesting information to the visitor by developing a program on a portable tablet. During the exhibition, visitors could hire the exhibition tablets and tour the gaol using the map and go through displays including original newspaper clippings and videos. 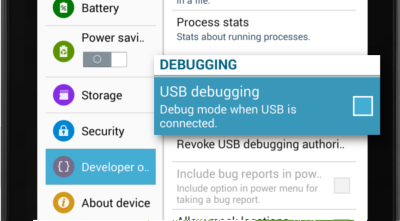 There was a need of a lockdown solution for Android devices which were being used so that visitors could use it by their own but not tamper with the contents of the tablets. What criteria did you have in mind when you were looking for the right solution? We needed a software solution that we could set up ourselves without needing a developer or coding experience. It had to be reasonably priced, easily installed and easy to manage.The exhibition building does not have Wi-Fi so we had to come up with special solutions to access files from the Android tablet's own SD card. How did you get to know about 42Gears? 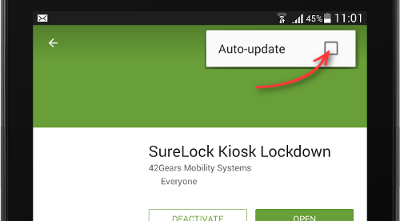 A software developer suggested we try 42Gears' SureLock. I downloaded the trial version and tested its setup. How 42Gears's products matched the requirements? 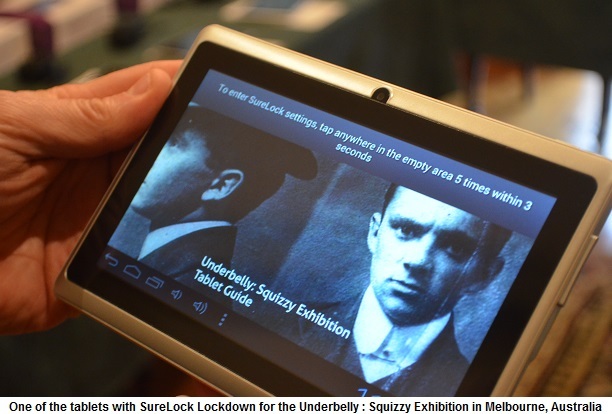 With SureLock, we have been able to set up a new visitor guide on Android tablets and confident that our paying visitors will not intentionally or unintentionally tamper with the contents or misuse the material. They can also use the device more easily because their choices are limited to the areas we want them to look at. Which 42Gears's products are being used for the exhibition? We are using SureLock because that did everything we wanted. We looked at SureFox but found Surelock managed all our needs. What did you find most attractive about 42Gears products? SureLock was the right application for our job. In the museum industry, it is very important to meet visitors' higher expectations and give them good experience throughout their visit. SureLock has helped us deliver a really good exhibition to the public. I appreciate the quick response from the support staff. Installing an application is one matter but customers need support and assistance. 42Gears gave prompt and courteous and efficient responses to some of my setup questions concerning setup of customised shortcuts. How would you rate 42Gears's support during the implementation process? Excellent - I received prompt and accurate solutions to my emails in 24 hours. "In the museum industry, it is very important to meet visitors' higher expectations and give them good experience throughout their visit. SureLock has helped us deliver a really good exhibition to the public. I appreciate the quick response from the support staff."